So, at the height of the season of indulgence, irresponsibility, and consumerism (viz 23:15 on December 25th) the BBC run a story announcing that Egypt is about to pass a law declaring copyright on all antiquities in the country. Although perhaps we should be reassured by the proviso that "... the law would apply to full-scale replicas of any object in any museum in Egypt" (my emphasis). The idea seems to be that, in order to raise money for the up-keep of Pharaonic antiquities, anyone who makes a profit out of a 1:1 reproduction of a monument such as the Pyramids or the Sphinx (or any of myriads of smaller items) should share that profit with the body maintaining the original antiquities. The emphasis seems to be on hotels and casinos and the like, although presumably sellers of reproductions will also be affected. Non-profit users will need to seek government permission, but may not have to pay anything. Can this be so? Do I hear someone murmuring "unenforceable"? I'm sure this will be leveraged against archaeologists who already have trouble getting permits to dig if they infringe various other rules of the SCA, but would a seller of reproduction statuettes in New York or London be subject to this law? Can you imagine this being enforced in Beijing? Maybe I misunderstand the law, and I have no experience digging or otherwise working in Egypt, but it seems strange to me. More to the point, while I have every sympathy with the need to raise money to protect and preserve antiquities, and while I can understand that one way to do this is to make the antiquities themselves profitable, I don't think this should be done by abusing the concept of copyright. Already several countries with rich ancient archaeology impose a supposed copyright on photographs of archaeological finds taken in the country, although this has been hard to enforce overseas. The repercussions of such laws on publications and especially teaching are unfortunate--even the need to ask permission before publishing a reproduction (or posting it, for example, on Flickr) is stifling too many cool initiatives to keep the love of the ancient world alive. Do I hear someone whispering "world heritage"? I'm tempted to go off right now and create a "full-scale replica" of the Great Pyramid of Giza in Second Life, just to see who'd like to test that particular combination of legal repercussions. I should stress, however, that this post is the ill-informed opinion of one seasonally-fatigued blogger, and not that of the site itself or its administrators. I've not been able to track down an official statement re this putative law on the websites of the Egyptian Government, the Supreme Council of Antiquities (whose website seems not to exist), nor that of its director Zahi Hawass. Anyone better informed (or with more mature opinions) on this topic than I, please leave a comment. Those of you who are in the AWBG facebook group will see that there is a link to the widget from there as well. If you want to play with this, follow the link, you can customize it as you will. Note also that I am making each contributor to this blog into an administrator, so you can pretty much do as you will with this space. First of all, thanks to Charles Ellwood Jones for the invitation to post on this blog. I'm an irregular and intermittent blogger that runs Digging Digitally, and most of the time my posts focus on "open archaeology". I thought I'd write a little more about some concerns I have around open access, open copyright, and open data in archaeology on this group blog. Let me preface with the point that I'm a big supporter and believer in open access scholarship and in freeing our content from the default restrictions of "all rights reserved" copyright. Access and less restrictive licensing are essential tools to better and more easily build on each other's works. I've been active in promoting Creative Commons licenses in archaeology, and the system I helped build "Open Context" tries to make it data sharing and collaboration easier. However, openness and the debate about open science and open scholarship is not without problems and conficts, especially in our field. Some researchers rightly worry about disclosing site locations because of looting risks. This may be a concern in some circumstances, but in others, sites locations may be general knowledge or already well known to looters. But there are other issues relating to looting and the commercial uses of the past, and highlight some of the problems in attempting to make a universal definition of "open data" for the sciences. I wrote yesterday about some of these issues with the release of Science Commons' new Open Data Protocol. This protocol is an important guide for international data sharing efforts in the sciences. Because of legal and practical complexities, the protocol basically advocates allocating scientific datasets into the public domain, so that they can be legally "mashed up", reused, and related with one another, no matter what their source. Widespread implementation of the protocol's ideas will no doubt facilitate great uses and reuses of scientific data, and will very likely encourage innovation and discovery. However, archaeologists need to debate and examine these definitions of "open science" and "open data". As I wrote yesterday, I think our community has a great deal of skepticism about relying upon social norms to enforce proper attribution and citation (my experience with Near Eastern archaeology suggests a great deal of mutual suspicion). However, beyond our own community dysfunctions, we need to carefully consider the implications of moving our research to the public domain. The public domain is sometimes highly contested, especially in the area of cultural patrimony where elements of the past are used to construct identities. Also, the public domain is totally unregulated. While this lack of regulation can make research uses easier, it opens the door to some possibilities that will make archaeologists uncomfortable. Do we want to see public domain images of excavated archaeological materials used in all commercial contexts? Would their use to assert the authenticity of items sold in the antiquities trade not give "open archaeology" a bad name? Frankly, I think some of these concerns are overblown. Our licensing choices probably won't have that much of an impact in the big picture of looting or site security. In some ways, what we do online now already buts up against the antiquities trade. Just type "archaeology artifacts" into Google and you'll see adds for antiquities dealers along with legitimate archaeological and museum information resources. Dive into GoogleEarth and you'll probably find some as yet unreported archaeological sites. Are looters using GoogleEarth now? We're in a brave new world, and open access, open licenses, and open data offer many powerful opportunities. But there are risks work worth discussing. The challenges and complexities we face in communicating our discipline no doubt have analogues in other places. These challenges need to be explored fully if we are to best shape openness in the research world. David Gill asked what we might want for Web 3.0. For my part, it's more stability, meaning widespread implementation and adoption of stable references that we can all use in the ongoing conversation that we are having on our blogs and in our digitally-implemented scholarship. On this blog, I have already made reference to Worldcat.org as one kind of stable reference that we can all point to when citing a book. In doing so I praised librarians. A task that librarians have not taken on via their catalogs is the indexing of the contents of their holdings. Not being a trained librarian, I don't want to misspeak but it is my understanding that the discipline has had an historic focus on the cataloging of physical objects - books, journal volumes, etc. - rather than on cataloging the discrete bibliographic entities within those physical objects. I.e., librarians don't separately describe the articles in a particular journal volume. In a networked world, it's the individual article that we care about, rather than its appearance in a particular physical volume. The Handle.net system is becoming a widely adopted standard for making unambiguous and stable references to individual digital objects, such as published journal articles. For example, http://hdl.handle.net/10.2972/hesp.75.4.453 is a stable reference to an article in Hesperia 75.4 (2006). Of course, you have to have an affiliation with a subscribing institution or pay money as an individual to read this article, but that observation is part of the conversation initiated on this blog by Chuck Jones' earlier post. Charles Watkinson, listed as an AWBG Contributor, has shepherded Hesperia into this world of stable references and that is a good thing. It can be a hassle to find Handles for particular articles but I have had reasonable luck using Crossref.org's DOI lookup form. Unfortunately, it is still the case that the vast majority of published articles have no widely used and computationally actionable identifiers. Another form of stable reference is the geographic entities being defined by the Pleiades Project. Here, the link http://pleiades.stoa.org/places/639166 is a stable reference to the record for the site of Xanthos in Lycia. Pleiades has a sophisticated data model which I encourage readers to explore, but let me just say for now that the project has established concisely composed URLs, such as that for Xanthos, that stand as usable infrastructure in a network-based historical geography of the ancient world. Tom Elliot, again an AWBG Contributor, has posted about the form and longevity of Pleiades URLs at his Horothesia blog. For texts, I look forward to the widespread adoption of the Canonical Text Services (CTS) protocol, which is the work of Neel Smith and Chris Blackwell. CTS defines itself as "a network service for identifying texts and for retrieving fragments of texts by canonical reference". In this scheme, "urn:cts:greekLit:tlg0012.tlg001" is an unambiguous reference to the Iliad that leverages the existing Thesaurus Linguae Graecae Canon of Greek authors. Why does reference stability matter? I suspect that for many readers of this blog this is not a necessary question. We're interested in substantive conversations about the ancient world and the analogy between linking and source citation is well understood. I am interested in the extent to which stable references will make conversations more discoverable. The use of links into Worldcat.org should make it more likely that I can find your reference to a particular book. Right now, Google does not do a good job of enabling such discovery. The link http://www.google.com/search?q=link%3Ahttp%3A%2F%2Fworldcat.org%2Foclc%2F144767610 does not return the blog post that made reference to this book. I do hope that in the near future the use of stable references will help bind together discrete contributions into a continuous conversation about the ancient world. David Instone-Brewer has just launched a new blog: Tyndale Tech: Electronic resources for Biblical Studies, with an interesting posting on "The future of communication"
Both the Latin and the Greek authors of Migne's monumental work are now available (among many other patristic resources) here. David Gill has discussed the way that e-learning technologies have changed over the last decade. This covers the use of podcasting, wikis and blogs in archaeology. He also speculates about what the future holds. The interview with Chris Hall is available as a podcast ("Tales from the Lab", Episode 5) from Swansea University's Learning Lab. There are also links to the podcasting blog that reviews the production of the materials. Latest postings from staff blogs are also listed. Something approaching 15% of all peer reviewed periodicals are open access. The Directory of Open Access Journals (DOAJ) now lists 3009 journals meeting their selection criteria. There are not yet enough open access periodicals in ancient studies to suit my taste, but more are appearing all the time. Have a look at the DOAJ Subject Tree for a good view of what's available there. Push your scholarship towards open access journals. Encourage your students, colleagues and teachers to publish in open access journals. Push postprint copies of your already published work to your institutional repositories. If you have open access pubications, make sure you bring them to the attention of those people, like me, who maintain portals to or indexes of open access material. If you have open access publications on the ancient world, let me know, and I'll index them in Abzu. And one more thing. Look at what institutions like The Oriental Institute, University of Chicago, are doing - simultaneous publication on paper (for sale) and in online digital facsimile (for free), and working through their back list of both in print and out of print publications with the goal of building a complete set. Encourage other institutions to develop and implement comparable policies. Bill Caraher's postings on Web 2.0 and archaeology provides a useful overview of how blogging is being used for our discipline. Only last week I was interviewed about changes in e-learning over the last 15 years and it struck me how far things have moved. I remember writing a review article, ‘Archaeology on the World Wide Web’, Antiquity 69 (1995), 626-30, that gave a snapshot of some of the (then) best sites. We have come a long way in those 12 years. What would we like to see in Web 3.0? I have posted the final installment of my Metablogging the Ancient World article on my blog: Archaeology of the Mediterranean World and posted updates to part 2 (I am now on v.3) based on comments from folks. Part 1 is a short history of blogging and academic blogging in particular. Part 2 is a more focused examination blogs on archaeology. Part 3 is a first attempt at an archaeology of blogging. Thanks to everyone who took time to read and comment on my work. I'll let this marinate for a week or so, make some more changes (I suspect!) and then it off to the folks at the Archaeology Website just before Christmas. This has been a particularly gratifying way to spend those last few semi-productive days before the disrupted time of holiday travel and festivities. I have been talking with Mark Rose who runs Archaeology Magazine's website about posting a story on blogging the ancient world with lots of links to good academic archaeology blogs. A few months ago, I began to collect links to blogs and write some text and attempt to great a typology of blogs and figure out what is really going on. Since many of the Ancient World bloggers mentioned in my article are now gathered in one place, I thought that I should run my piece by the group before sending it off. I've posted the very general introduction at my blog and post here the second part. The final part on the archaeology of blogging (archaeology in a simplified Foucaldian sense) will appear on Saturday (let's hope) on my blog (got to share the love). Any comment on this would be great, and please let me know if I have mischaracterized your blog or your identity in some way! As I began to blog, I was on the lookout for models to understand the medium of blogging more clearly. I gravitated primarily toward blogs which focused on the archaeology of Mediterranean world, Classics, and Ancient History to see how my disciplinary peers were engaging the New Media. I tried to understand the (relatively recently) history of blogging the ancient world to determine whether the trends and patterns that I observed in blogging behavior in general carried over into academic blogging. From what I can gather, there were archaeology blogs in the first wave of intensive blogging. In the late 1990s several projects by both professional and avocational archaeologists were underway to expand classics and archaeology into the digital realm. Ross Scaife at the University of Kentucky established The Stoa Consortium in 1997, and by 2003 Scaife and others were running a blog that today it is the main portal into the remarkable collection of material collected by that project. David Meadows efforts at the Rogueclassicism began in the late 1990s with a news group. By the early 2000s, it had become transformed into a blog and continues to this day to provide a compendium of links, news stories, and witty remarks on the classical world and archaeology. Dorothy King’s Ph.Diva blog, which is now accessible by invitation only, debuted in 2001, and for over 5 years and provided astute commentary on archaeological and cultural maters from her base in London. Avocational archaeologists and enthusiasts likewise brought their passion for archaeological news to the web. Archaeologica News began in the early years of the century, and still offers links to archaeological news from around the world. With the success of these “early adopters”, the great expansion of archaeological blogs began in 2002. A convenient barometer of the visibility of weblogs is Archaeology Magazine’s review of websites of interest to both professional archaeologists and the general public. They posted a two part review of archaeology websites in 1997 (here and here) and blogs are not mentioned (as might be expected at such an early date). By 2000, they mention the anthropology new page at Texas A&M which is essentially in the form of an early blog and About.com’s archaeology page which featured a blog by archaeologist Kris Hirst from the late 1990s. In 2002, however, they dedicated an entire web review to the blog ArchaeologyOnline which lists newsworthy items for archaeologists with short commentaries. By this time, the number and diversity of archaeological blogs had expanded greatly. Today the variety is almost limitless. Popular and newsy blogs like Roman Times, Archaeoblog, remote central, or Archaeology in Europe continue the tradition of avocational archaeologists posting news, notes, and links for anyone interested; archaeologist, Ioannis Georganas, provides news and notes from a wide range of sources on his blog Mediterranean Archaeology. Blogs like Abnormal Interest and Thoughts on Antiquity have a more varied approach than traditional news blogs, interspersing news links with useful and sometimes amusing commentary on archaeological and ancient topics. Aardvaraeology, Martin Rundkvist’s quirky and popular Swedish blog, provides an opinionated perspective on scientific archaeology with a particular focus on Scandinavia. Judith Weingarten’s blog Zenobia uses her smooth style to expand on the topic of her recent popular book The World As it Was which is part of a projected three part work of historical fictional called Chronicle of Zenobia The Rebel Queen; her blog provides general information on the ancient Near East and Palmyra. Several blogs like Louise Hitchcock’s LA(H) Confidential and Adventures with Yo and Mo provide insights into life as a working archaeologist both during the season and during the rest of the year. Mary Beard’s A Don’s Life, hosted by the Times Literary Supplement, is perhaps in a league of its own, making insightful and amusing comment on both ancient and contemporary topics. Most of these blogs are geared toward the educated public although even the most jaded academic will often find useful links and insights on their pages. At the same time, there is a growing collection of genuinely academic blogs, many of which continue discussions from books or articles into the blogosphere and adopt a less formal, but no less serious tone. The best example of this genre is David Gill’s Looting Matters which is an extension of his serious research interest into archaeological ethics and cultural property (joining the Illicit Cultural Property Blog and SafeCorner to track affairs involving archaeological looting and the trafficking of illegal antiquities). Troels Myrup Kristensen’s blog Iconoclasm details his archaeological travels in the Mediterranean with special attention to incidents of the destruction of pagan statues by Christians in the Late Antique period. Kostis Kourelis’s new blog Buildings, Objects, Situations is set to revolve loosely around his interest in the intellectual and cultural history of archaeology and the study of material culture. Alun Salt’s Clioaudio ranges freely across the discipline, but often returns to his interest in archaeology and archaeoastronomy. The same breadth and academic feel comes through in Archaeolog which is a group blog hosted by Stanford’s MetaMedia Lab. Even more specialized blogs give the public a view into rarified or highly specialized fields. Current Epigraphy or What’s New in Papyrology disseminate information on inscriptions and papyrology for experts in these disciplines. In addition, Current Epigraphy has become a platform for collaborative readings of inscriptions by bringing together scholars from all over the world to help solve epigraphic conundrums. Archaeologist can also keep track of the acquisitions of the Blegen Library at the American School of Classical Studies at Athens in their Blegen Library Blog. New online resources for scholars often appear at Joint Library of the Hellenic & Roman Societies / Institute of Classical Studies Library Blog as well. Users of the massive Project Dyabola database can follow their progress through their Project Dyabola Blog. The Persepolis Fortification Archive Project also disseminates updates and new through a blog. These specialized blogs will not be of interest to everyone, but they have tapped into the rich potential of digital media to communicate, inspire, and promote collaborative scholarship. Shawn Graham’s innovative Electric Archaeologist shows how a whole range of digital media can assist an archaeologist in research and teaching. Sebastian Heath’s blog Mediterranean Ceramics explores the intersection of the study of Mediterranean ceramics and the resources available on the internet. Tom Elliot, the director of the Pleiades Project which brings together geographic and historical information for ancient places across the Mediterranean, makes occasional posts at his horothesia blog. His main interest is developing innovative and open methods to disseminate archaeological and historical data. Scott Moore’s Ancient History Ramblings has developed a serious focus on archaeology in the virtual world of Second Life. Charles Watkinson, the director of publications at the American School of Classical Studies maintains an occasional blog on “communication in the humanities and social sciences.” Digging Digitially provides some great info on digital archaeology as the “Semi-offical” news source for the SAA’s Digital Data Interest Group. The Okapi Project’s blog from the University of California at Berkeley includes regular reports on their innovative efforts to disseminate academic research through digital media – including their work with the Çatalhöyük excavations. The ease of updating a weblog makes it a useful tool for archaeological field projects to use when they are in the field. Daily or weekly updates can convey the immediate excitement of a new discovery. My project, the Pyla-Koutsopetria Archaeological Project, maintained two weblogs during the 2007 season: one for our graduate students and one for the senior staff (which it continues to maintain through the off season). Mia Ridge and Jason Quinlan blogged their experiences from Çatalhöyük. Penn State students, Amanda Iacobelli, Jeff Rop, and Ben Bradshaw, described their work Cilician Plain Survey Project in a blog called Real Time Archaeology. The Tell es-Safi/Gath Excavations Official (and Unofficial) Weblog keeps their team members informed about events both during and after the field seasons. Wessex Archaeology is among the most sophisticated examples of this providing not only text blogs but also regular podcasts. The Port Tobacco Archaeological Project also maintains a great blog that tracks their progress on an 18th century site in Maryland. For the past several years Archaeology Magazine has hosted “Interactive Digs” which, although not exactly a blog, similarly let you follow the weekly or daily events of several ongoing archaeological projects. Finally, an increasing number of institutions are maintaining blogs to keep you informed on events or programs. Gary Vikan, the curator of the Walters Art Museum, whose blog deals widely with matters involving the world of art, museums, and ancient culture. The University of Missouri at Columbia maintains a blog called Musings that keeps folks up to date on the goings on at the Museum of Art and Archaeology. George Washington University’s Classics and Semitic Studies program blog touches upon events in their program but also provides some helpful information for prospective graduate students in Classics, Archaeology, or Ancient History (like describing what a Post-Bacc program actually is!). Tulane University’s Classics Department began a blog in the immediate aftermath of Hurricane Katrina and it continues to provide helpful information on that program’s affairs. The Art and Social Identities Program at Aarhus University in Denmark also updates a blog making available the events sponsored by that program as does the Archaeological Institute at the University of Hamburg (in German). While archaeologists have not yet explored completely the usefulness of blogs for the instantaneous publishing of archaeological data, figures, photos, or even videos, it is clear that the ease in creating and maintaining weblogs will make them increasingly appealing options for archaeologists seeking to create a more transparent approach to fieldwork and research. For members of the public, avocational archaeologists, and professional archaeologists and academics, blogging archaeology is a good and expanding way of both participating in and keeping abreast of new research in the discipline. Gerry McKiernan, who blogs on Social Networking Sites for Engaged Library Services brings an article from NextSpace (The OCLC Newsletter) to our attention. Lori Bell (Alliance Library Systems, Second Life Librarian and Director of Innovation), Edward Castronova (Indiana University, Associate Professor of Telecommunications), Paul Jones (ibiblio.org, Director), Hemanshu Nigam (MySpace, Chief Security Offfice), Kitty Pope (Alliance Library System, Second Life Librarian and Executive Director), Fred Stutzman, University of North Carolina at Chapel Hill, Ph. D. Student), Stuart L. Weibel, Ph. D. (OCLC, Consulting Research Scientist) are asked to explore and comment on the trends and behaviors of users of the social Web. Joe Weaks of The Macintosh Biblioblog quotes Larry Wall's piece in the O'Reilly site. Weaks writes "He is surveying the progression of scripting languages, and rightly notes that the debate whether any given language is a programming language or a scripting language is a cultural one. " Interesting, read more there. I have added an entry for this Blog in The Academic Blog Portal, specifically to the list of Classics and Ancient Languages blogs. Have you added your blog? What other indexes are useful tools? I'm MythMan, and I'm proud to be invited to the Ancient World Bloggers Group. I gladly join, but you probably won't see much evidence of me here but links (through important/semi-important words) to my etymology blog. Like the static-between-channels (on your TV) is an echo of radiation from "the Big Bang," so the words and speech commonly used today is an echo of caveman-babblings assigned meaning by the Mind of Man. Through knowledge of the words' origins and of the reasonings behind the modification therefrom, we who speak can refine our language to the purer meanings we truly intend. The Sunday Times (London) has just published a list of the best history books of 2007. Joanne Berry's The Complete Pompeii is in the seven books discussed. Congratulations to her! This book’s strengths are its accessibility and up-to-dateness. 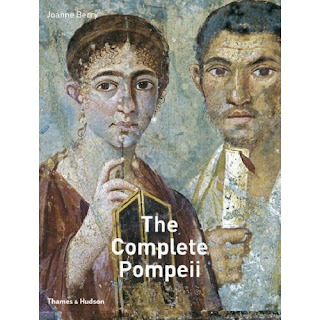 Hundreds of volumes have been written about Pompeii and Herculaneum, but few have offered such a thorough overview, and even fewer can boast such fresh information. Berry is not the most stylish of writers, but she deals thoughtfully with all aspects of the subject, from the eruption itself and the often messy archeological history to the individual finds. Beautifully illustrated, it is an ideal introduction to one of the world’s great classical sites. The library community is incredibly lazy admirably generous in that it makes its cataloging records available at the site worldcat.org. Ronald Syme took a dim view of Augustus' exercise of power in his The Roman Revolution. Following that link provides readers all the information they need to track down a book. It even uses your IP address to list holdings in "nearby" libraries. If the library makes a digital version available, that information is noted as well. This isn't my idea. I can't remember where I saw it first, but I would give credit if I did. Meeting at Chicago AIA/APA - Thurs., Jan. 3 @ 9:00 PM? As a first try at a real-world AWBG community activity, I'm trying to organize a get together at the AIA/APA meetings in Chicago. How about Thursday night at 9:00 PM? That's after the opening reception. I don't know enough about Chicago to recommend a place other than "the hotel bar." That will be crowded, I know, but is an easy default. Feel free to complain about this time in the comments and if it really doesn't work for most people, we can change it. But also feel free to comment saying you're coming, maybe with a link to your blog and things to talk about, etc. I blog at http://mediterraneanceramics.blogspot.com and you'll see that I've linked to AWBG. That's another fine thing to do. Welcome to the Ancient World Bloggers Group Blog. Cooked up in a conversation between Sebastian Heath and Chuck Jones in early December 2007, the idea is to experiment with this space as a meta-blog - A space where we can communicate notices of real worls bloggers meetings; a space to arrange and coordinate themed blogfests; a space to review the current state of ancient world blogging; a space to meet as yet unthought of needs. It also serves to complement the facebook ancient bloggers group, but is open to a broader readership and to the search engines. Many ancient world bloggers have been invited to join. If you would like to participate, let me know, I'll add you.